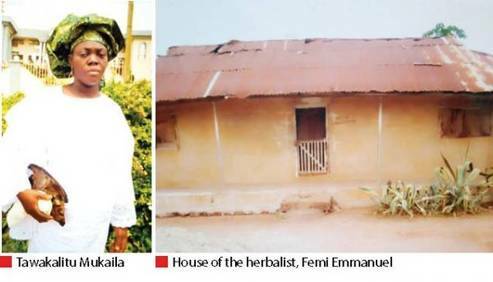 LAGOS APRIL 15TH (NEWSRANGERS)-A herbalist, Femi Emmanuel, is now with the police in Kwara State for allegedly causing the death of a 45-year-old woman and a mother of two, Mrs Tawakalitu Mukaila, in his house. Mukaila, the husband, said: “Tawa told me about what one Emmanuel, a spiritualist, told her while hawking at Omu-Aran market and I told her to ignore such antics from the said spiritualist. “She told me of her intention to join us at Yenbereku to participate in the cashew business so that she would have enough money for the family. On Thursday I was told of her disappearance and eventual death on Saturday and I quickly left for Omu-Aran,” he said.